Need for Capacitive Load Cells? 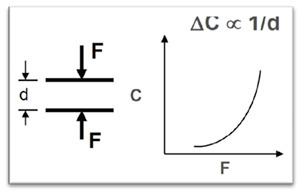 One of the questions we get asked frequently is why use capacitance? Resistive sensors have been used for a long time…so why change? Why now? The amount of charge that can stored (its Capacitance) depends on the area between the plates, the distance between the plates and the dielectric constant between the plates. 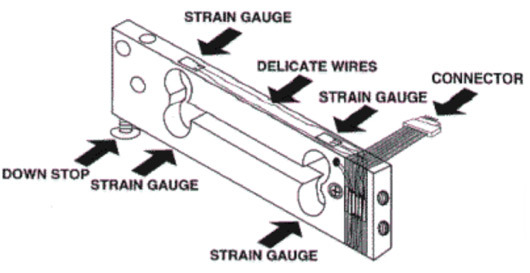 For a typical 350 Ohm strain gauge, the change in resistance for full scale loading at full deflection is of the order of 0.7 Ohms! Just 0.2% of full scale. The circuit used converts the full scale deflection into an output change of just 20 millivolts which need to converted into 5000 divisions to achieve 0.02% accuracies! For e.g. if there is a need for very high sensitivities, then the starting gap between the plates can be decreased. So for e.g. if you start with 0.10 mm gap and still change by about 0.5 mm in response to applied loads of say just 1 lb, then you still get 100% change in capacitance! The change in resistivity is very small – and there is a limit to how small the strains can be as the device gets smaller – and still achieve reasonable resistivity change to still be usable as a sensing system! The mechanical deflections need to be increased in order to achieve greater strains – but this means the sensor becomes less rugged and more delicate in practice, leading to damage to the sensor and/or need for repeat calibrations. This is one of the most important advantages offered by a capacitive sensing device – it allows one to achieve very high sensitivities in very small packages. It allows capacitive sensors to offer high sensitivity in very rugged, tough packages that can withstand much higher peak loads than a similar resistive sensor with similar sensitivity. They can be built using conventional fabrication techniques without need for sophisticated MEMs or other semi-conductor fabrication methods. 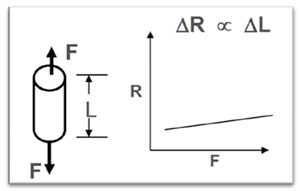 The fundamental measurement circuits to measure capacitance changes are similar to the ones used to measure resistance changes. However, instead of using analog DC voltages of the micro-to-millivolt range outputs, we use the charge discharge frequency of a capacitor – converted into a square wave output – as the fundamental measurement circuit. Noise immunity: Since we are not trying to measure the level of a tiny analog DC signals (0 to 20 milliVolt) in the midst of ambient noise (of the order of +/- 1 millivolt) our noise levels are much lower. We measure the number of low to high transitions of the square wave (frequency) of the output signal – and so at a very low analog level – our signals are “digital”. We don’t need an ADC to convert the signal into a digital format. By counting the pulses of the square wave (or low to high level transitions) we get a “count” of the wave in a defined time interval. Generally speaking, this counting function is easily available on a Digital I/O pin of most commonly available micro-processors. For e.g. One can use a capacitive sensor to sense position (by varying the gap or varying the area). Such position sensors can be used to detect the thickness of films, or detect earthquakes or be used to create micrometers. By varying the dielectric property of the substance between the plate, one can detect things such as variations in humidity or the change of material properties (such as the quality of motor oil in an engine) with time and use. A proximity or touch sensor can be created by the capacitive coupling of a finger coming close to a capacitive zone. Such "touch sensors" are now commonly used in applications such as smart phones, appliance control panels, car dashboards and other interactive panel applications. One can combine various sensing elements into a single unit to make a multi-purpose sensor with the basic capacitive sensing platform we have created. When produced in volume, the cost of manufacturing capacitive sensors are an order of magnitude cheaper than producing similar volumes of resistive load cells manually. Therefore capacitive sensing techniques offer a great combination of three key parameters: high sensitivity, small size and low cost – a hard to beat combination! However, note that, despite these advantages, capacitive load cells may not always be appropriate for monitoring applications that require high accuracies over long periods of time and when used in environments with changing temperatures and moist . We recommend using the capacitive load cells for applications that require a quick measurement where the initial conditions can be zeroed out and where the environment is maintained at steady room temperature and humidity conditions. Please consult Loadstar Sensors for advice on the most appropriate sensor for your application.